The International Labour Review has long been an important resource for scholars and policy makers. And today, at a time when concerns about the need for decent work are greater than ever, a better knowledge base is essential for the design of labour and social policy to meet this need. With this in mind, the International Labour Review, the ILO’s flagship journal since 1921, has been reorganized. First, a new editorial team has been put in place. Second, the ILR will be associated with the ILO’s International Institute for Labour Studies (IILS), whose Director chairs the new Editorial Board. Third, the Board of Advisers is being reinforced and restructured. Fourth, a partnership has been established with Wiley-Blackwell, which will henceforth distribute the journal and, from 2008, publish it. As a global multidisciplinary journal of labour and social policies and relationships, the new ILR is open to articles which meet scholarly standards but which are written in a way that is accessible to a wider readership. They may cover any of the fields of interest of the ILO – employment and labour markets, training and skills development, social security and social protection, labour law and labour institutions, rights at work and social dialogue. The pages of the journal are also open to all relevant disciplines – economics, law, sociology, political science – and articles taking an interdisciplinary perspective are particularly welcome. In addition to the main articles, a separate section will contain a small number of reviews of major books, and a new “Notes, debates and communications” section will report on recent and upcoming events of interest to the readership, analyse important recent developments in the world of work, and provide summaries and access to important documents with major policy implications for labour and development. As one of the few journals to come out in English, French and Spanish, with a worldwide readership, the ILR aims to become the obvious first choice for publication of high-quality research by all those concerned with labour and employment. Current issues of the International Labour Review can be located here. 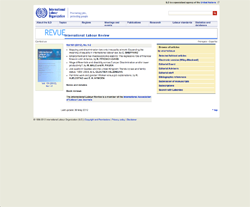 Past issues of the International Labour Review can be located here. Bibliographic references to the International Labour Review can be located here. A selection of full texts published in the International Labour Review can be located here. From 1 January 2008, all subscription requests for all volumes should be directed to Blackwell Publishing. Customers in the UK should add VAT at 7per cent; customers in the EU should also add VAT at 7 per cent, or provide a VAT registration number or evidence of entitlement to exemption. Customers in Canada should add 6 per cent GST or provide evidence of entitlement to exemption. The Premium Institutional price includes online access to the current and all online back files to 1 January 1997, where available. For other pricing options including access information and terms and conditions, please visit Blackwell Publishing.